Excerpted from an interview with David Meltzer, conducted by Marina Lazzara and Steven Jones. This resurgence of interest in the Beats is what I call a kind of cyclical retrieval of the grandparent. When you're in a family it's usually the grandparents that are much more interesting than the parents --- at least to the young people. So I have the feeling that for the young generation today, the Beats are looked upon as exotic grandparents who might have something to offer, at least the Beats who haven't melted down, or become bitter. 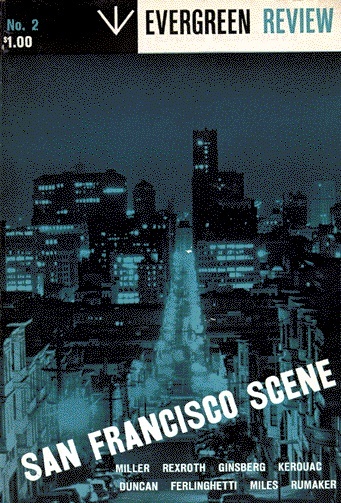 In the '50s San Francisco had a much more complex art and political scene, as opposed to today's rather one-dimensionalized version that's feeding a mytho-mania of an essentially consumer object [the Beats]. The North Beach of the '50s was a very comfortable place for artists and writers. The Italians had maintained a tradition of art and poetry and so forth, and weren't at all antagonistic towards Bohemians or artist types. But then the place became publicized and suddenly all these businesses began springing up. Admittedly, it was kind of fun to be a part of a counter-culture and watch the tourists visit your neighborhood as though it were a kind of weekend zoo. But it became entrepreneurial very early on, which was obviously counter to the kinds of lives that everyone was leading. Lives that involved unvoluntary vows of poverty, anti-materialism, all of this. The Beatnik was the first American counter-cultural dissident that had the disadvantage of being incorporated by television. Television networked consciousness and very early on did unfortunate things with the Beat presence. Dobie Gillis, Maynard G. Krebs, Peter Gunn, bongo playing, the beret ... even Funny Face. It one-dimensionalized what was originally a post-war gesture of dissidence and defiance to post-war prosperity and conformity. This original gesture lasted for about a year, as do most of these things before they lose their novelty. But by the time that happened a kind of entrepreneurial culture had established itself, like those little fish that attach themselves to whales. Then you actually got people from within the community selling themselves as Beatniks for Hollywood. And after that the scene degenerated and dissipated because the economy collapsed. After a while, how many Beatnik Greyline tours can you have?